Sorrow and joy are inseparable. Our minister is available to conduct funerals either at St Mark's or at one of the local Crematoria. He may be contacted directly or via one of the local Funeral Directors. Des will meet with the family to discuss the arrangements and help shape the service in response to the family’s wishes and is happy to conduct both traditional and non-traditional services. No previous connection with the church is required. 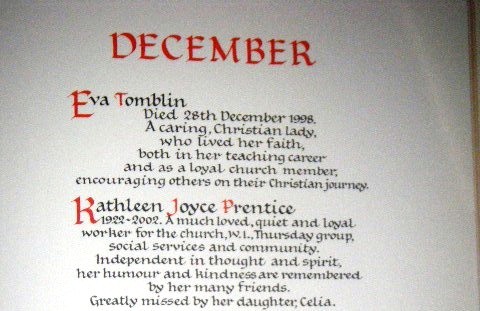 At St Mark's Church there is a Book of Remembrance where the names of departed loved ones may be recorded. The page where their name is recorded will be open during the month of the anniversary of their death and they will be remembered in prayers offered in church during that time. At Easter time when we celebrate Jesus' resurrection we create a display of lilies to remind us of those whom we have loved who have died. 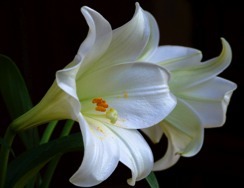 Please contact us if you would like to contribute to the display of lilies.